We are so excited to have you as a part of our community this year! 2017 has kept us on our toes with an unprecedentedly cool and wet spring. This year we had ground covered in snow through mid-March! When all that snow melted we were left with some really cold wet earth. Despite so many gray days in March and April we kept on schedule with all our seeding and planting dates. We have been getting garden beds ready to plant and steadily planting in the field now for the last 7 weeks. Despite OUR schedule this year we have found that plants without any warmth or any sun will grow Really Really Really Slowly. 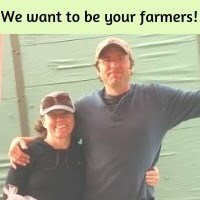 We have fewer crops than we usually do this time of year but we are so excited that we have enough to start CSA in mid May. 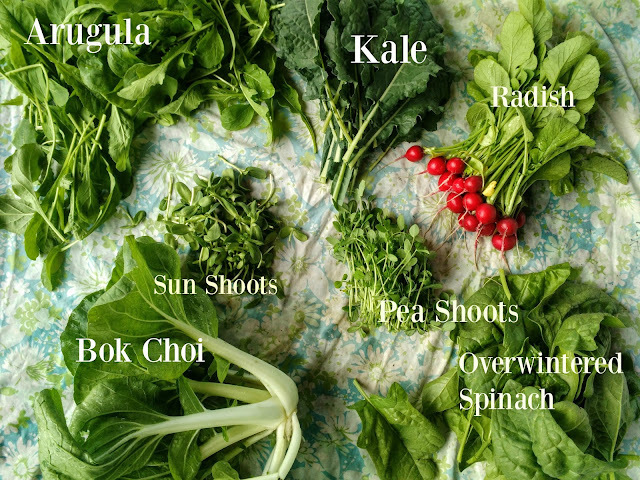 This week your box is full of spring green veggies perfect for sauteing, stir frying, and making beautiful salads. Spinach- we know the leaves of this spinach are HUGE! You may be surprised by the thickness and sweetness of the leaves. This is our really special overwintered spinach that was planted last fall for early spring spinach. This is a variety we love that grows huge leaves. They are perfect chopped for a salad, to make wraps, or chopped and sauteed. It doesn't cook down as much as regular spinach and keeps a wonderful sweet crunchy texture after being cooked. Arugula- arugula is a spring and fall crop. The early spring arugula is often the best of the year. It's so tender with just a little bit of that peppery kick that makes arugula so amazing. If arugula flavor is just too much for you on it's own in a salad try substituting arugula in your favorite basil pesto recipe for a tasty Arugula Pesto treat! We also love arugula finely chopped and sauteed with eggs. Radishes- We love radishes chopped up to top a salad and we also love them thinly sliced on a platter to dip in salt as a tasty kid friendly side dish. We also like roasting and grilling them! The tops on these radishes are simply gorgeous and miraculously free of any bug damage (bugs love radish tops!). Did you know you can eat radish tops? They are really good! We chop the radish tops and saute them to add to stir fry or for our weekly breakfast egg bake. Pea Shoots-These are a new crop for us this year and !Oh Man! The little people in our house are in love with them. We are always super big fans of veggies that kids love :). These taste just like peas and as such they are good on their own. We are enjoying topping our salads with them for a tasty treat. Our hearts are so full knowing we are growing nutritious and delicious food for you and your family.